Hydronic Boiler features less than 9ppm NOx, which can be achieved across all ambient conditions while maintaining efficient operation and full modulation. 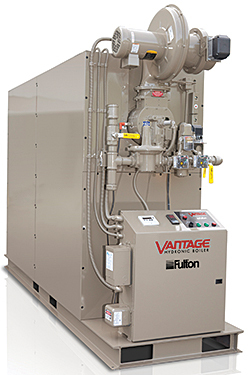 The Vantage series condensing hydronic boilers low emissions model is available in 3 million BTU/hr and 4 million BTU/hr. The boilers feature a condensing heat exchanger of Duplex alloy steel, for corrosion resistance and low thermal expansion rates.